Andrews McMeel Publishing, 9780740768507, 152pp. 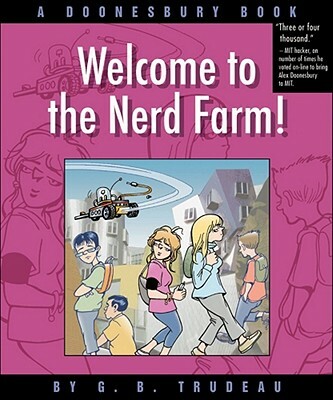 In Welcome to the Nerd Farm : A Doonesbury Book life comes full circle as another Doonesbury Gen Nexer heads for college. With Zipper way-too-deeply embedded at Walden (America's number-one safety school) Alex boldly opts for MIT, the nerdfarm, where 30-hour study binges are de rigueur. Daily 911 calls home and a sense of doom (Just get some duct tape, roll me up in my bedspread, and ship me home . . .) give way as Gal Doonesbury finds fellowship among the similarly exhausted: No nerd left behind, explains roomie Drew, as they co-brainstorm their way through finals. The indomitable Granny D struggles with a life change as well; the move from sunny Oklahoma to live with Mike and Kim in saturated, caffeinated Seattle leaves her distinctly unbuzzed. Then there's the on-air unraveling of Mark and Chase's marriage (I'm tired of living with a Nazi ), with Joanie handling the technicalities of dissolving a legally nonexistent union. Equally traumatic is Uncle Duke's change of status, emerging from a months-long stupor to find himself pulling down six figures as a K Street lobbyist-and reregistering as a Democrat. Also shifting kin groups is B.D., who reluctantly joins PTSD group therapy, where Dex, Kurt, and Jason call him on much-needed 'tude adjustments. But there are signs of improvement: I didn't explode he exults, after finding Zipper living in his office. That homeless yet ebulliently overoptimistic undergrad is deeply smitten with Alex, but is dangerously far ahead of her--picking out their future tabloid nickname before she even knows they're an item. Understandably, her considerable attention is focused elsewhere--on surviving MIT's killer grind and on the Battle of the Bots, a high-tech smackdown where she unleashes Alfie, an impudent, high-end hoverbot. Bring it, techgirl. G. B. Trudeau has been drawing his Pulitzer Prize-winning comic strip for more than forty years. In addition to cartooning, Trudeau has worked in theater, film, and television. He also has been a contributing columnist for the"New York Times "op-ed page and later an essayist for "Time "magazine. He is a fellow of the American Academy of Arts & Sciences. He lives in New York City with his wife, Jane Pauley. They have three grown children. Trudeau maintains a vivid online presence at www.doonesbury.com and offers deployed troops a forum via his milblog The Sandbox.